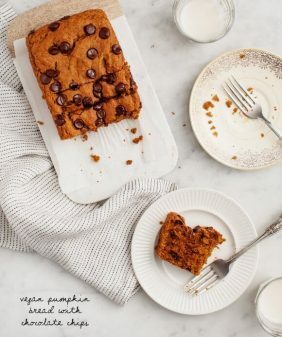 Fluffy vegan pumpkin pancakes are a yummy treat for a cozy fall breakfast! Easy, freezer friendly, and deliciously spiced, they're perfect with maple syrup. It’s October 1st – let’s do this pumpkin thing! Anyway, I’ve had so many requests for vegan pumpkin pancakes, so here we go! 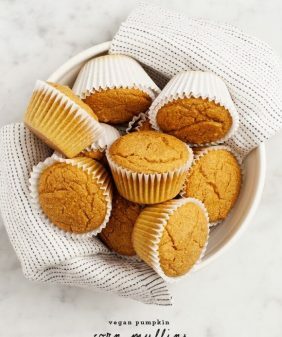 Flax replaces the egg, and the pumpkin gives them moisture and lift, making these nice and fluffy. As for the pumpkin-type spices – I use straight up cinnamon here. 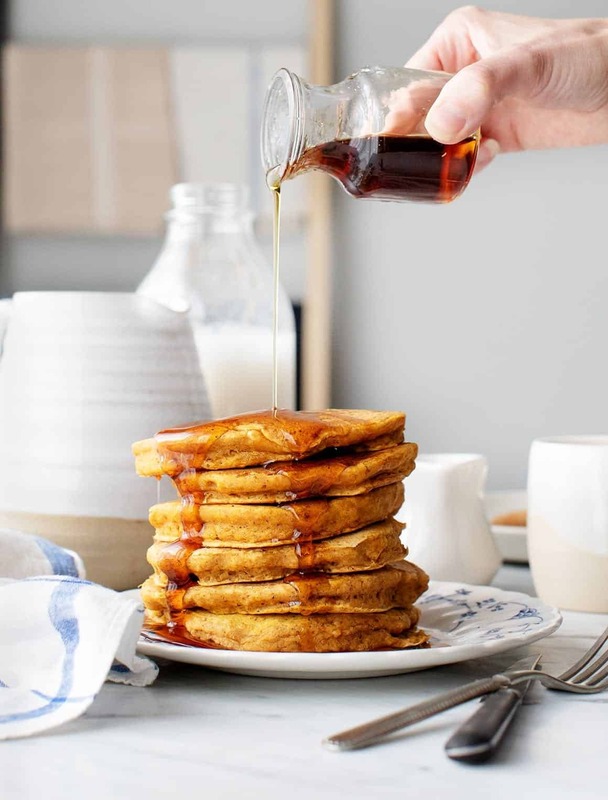 I think its simple flavor is perfect once the maple syrup hits the hot pancakes. But if you want to use pumpkin pie spice, or add nutmeg, ginger, allspice, etc… feel free to get creative. And, um, if you’re going to un-veganize these like I did for the sake of the photo below, Stonyfield’s double cream plain yogurt was insanely delicious as a topping with some toasted pecans (not sponsored, just saying). If you’re vegan, coconut yogurt would be delicious too. In a small bowl, combine the flaxseed and water and set aside for 5 minutes to thicken. In a large bowl, combine the flour, cane sugar, baking powder, baking soda, cinnamon, and salt. 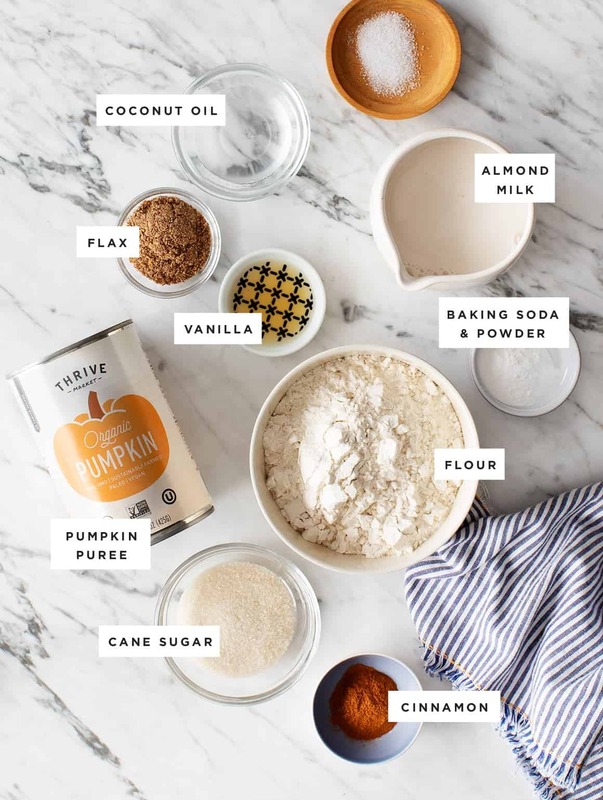 In a medium bowl, whisk together the pumpkin, almond milk, coconut oil, vanilla, and the flaxseed mixture. Pour the wet ingredients into the bowl with the dry ingredients and stir until just combined. A few lumps are ok, do not overmix. The mixture will be thick, but if it’s too thick, gently stir in a little more almond milk. Heat a nonstick skillet or griddle to medium heat. Brush the skillet with a little coconut oil and use a ⅓-cup measuring cup to pour the batter onto the pan. Use the back of the cup to gently spread the batter a little more. Cook the pancakes for 2 minutes per side, turning the heat to low as needed so that the middles cook without burning the outsides. I usually start with medium heat, and move to low heat as my pan starts to hold residual heat after each batch. Serve with maple syrup, yogurt, and pecans, as desired. Looks amazing! Can’t wait to try it this weekend for Canadian thanksgiving! I have one little question though. 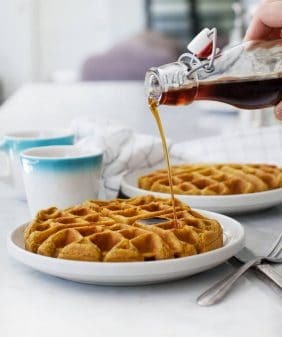 What is the benefit of the coconut oil in the batter and is it necessary? Hi Mila, I hope you love them! I like a bit of oil in my pancakes for flavor and texture – I find pancakes to be a bit dry/gummy without it. These sound really nice, even though I am not vegan. I would probably also use a real egg. Love the idea of using that yogurt as a topping. And I like the idea of using just cinnamon instead of pumpkin pie spice. 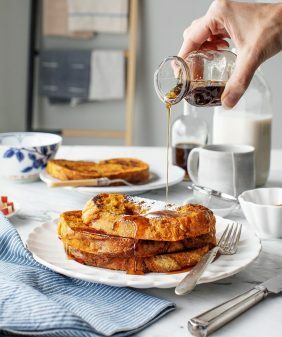 I’ll have to make these with the leftover pumpkin from my pumpkin French toast that I’ll be making when it’s my turn to cook again (my husband and I take turns – 3 weeks for me, 1 week for him). yum! these are so perfect for fall! Lol to your comment that maple syrup isn’t optional! I’m Canadian, so we put that stuff on everything (just kidding). But def on pancakes! 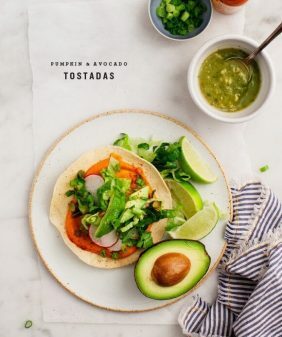 Recipe looks delish. 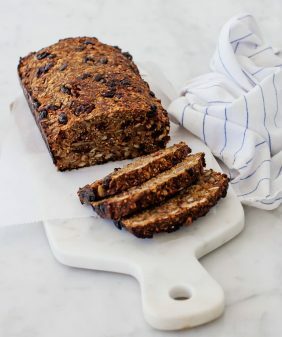 Jeanine, would these work without the flax seeds or do I have to substitute them with something else? Hi Daphne – you can use 1 egg in place of the flax and the 3 tablespoons water. Hope that helps! Hi Becca, you can use any neutral oil – sunflower, grapeseed, a mild olive oil, or canola oil. Hope that helps! They’re easy 🙂 Just make sure give them the 2 minutes per side and they should stay in once piece! I love your website. Thanks. Thats great thank you so much! Cant wait to try this! omg, look at how thick and fluffy they are 😍 I need these in my life right now! The texture and flavor was a hit! Thanks for this recipe. My grocery store was out of almond milk this week, so I substituted soy. But they were still delicious! I also used coconut sugar instead of cane sugar because it was what I had on hand. I added a little extra because coconut sugar is supposed to be less sweet. Hi Alison, I’m so glad you loved them! Thanks for taking a moment to come back and let me know!! Hi Sal, ha ha, I’m so so thrilled that you loved them! I was out of flax meal so I used 1 tablespoon of chia seeds with 2 1/2 tablespoons of water instead, and these were great! I enjoyed the mild flavor of just the cinnamon with the pumpkin, I don’t care for the pumpkin pie spice blend. Hi Amanda, I’m glad you loved them! Best pancakes I’ve made yet! fluffy! annnddd so tasty! Thanks for sharing! I’ve made them over and over. Hi Sal, I’m so happy to hear that! Thanks for reporting back! !